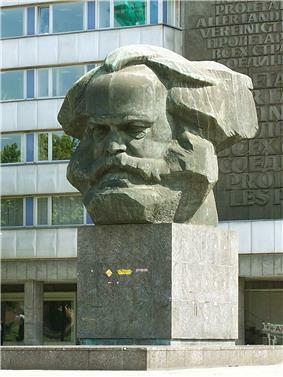 Chemnitz (German pronunciation: , known from 1953 to 1990 as Karl-Marx-Stadt), is the third-largest city in the Free State of Saxony, Germany. 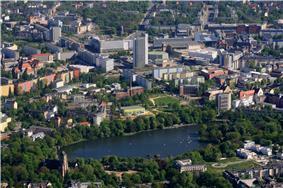 Chemnitz is an independent city which is not part of any county and seat of the Freistaat Sachsen. 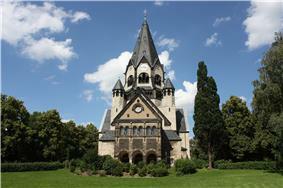 Located in the northern foothills of the Ore Mountains, it is part of the Central German Metropolitan Region. The city's economy is based on the service sector and manufacturing industry. 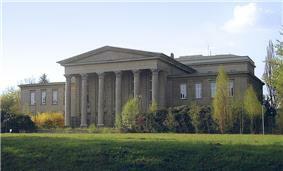 Chemnitz University of Technology has around 10,000 students. 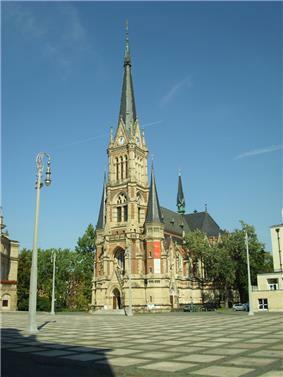 Chemnitz is named after the river Chemnitz, a small tributary of the Zwickauer Mulde. The word "Chemnitz" is from the Sorbian language (Upper Sorbian: Kamjenica), and means "stony [brook]". The word is composed of the Slavic word kamen meaning "stone" and the feminine suffix -ica. It is known in Czech as Saská Kamenice and in Polish as Kamienica Saska. There are many other towns named Kamenica or Kamenice in areas with past or present Slavic settlement. 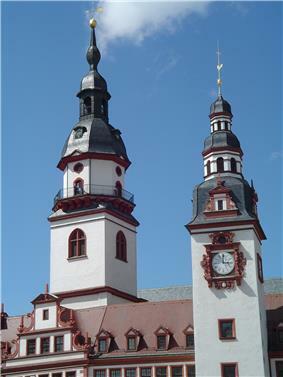 An early Slavic tribe's settlement was located at Kamienica, and the first documented use of Chemnitz was the 1143 site of a Benedictine monastery around which a settlement grew. Circa 1170 Frederick I, Holy Roman Emperor granted it the rights of an imperial city. 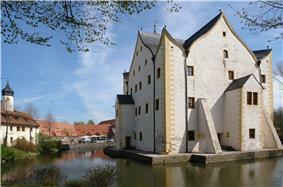 In 1307, the town became subordinate to the margraviate of Meissen (the predecessor of the Saxon state). 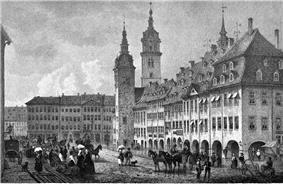 In Medieval Times Chemnitz became a centre of textile production and trade. More than one third of the population worked in textile production. "The people who live here, do not look back, but look forward to a new and better future. They look at socialism. They look with love and devotion to the founder of the socialist doctrine, the greatest son of the German people, to Karl Marx. I hereby fulfill about the government's decision. I carry out the solemn act of renaming the city and declare: From now on, this city bears the proud name and mandatory Karl-Marx-Stadt". After the city center was destroyed in World War II, the East German authorities strove to rebuild it to symbolize the conceptions of urban development of a socialist city. The then layout of the city center was rejected in favor of a new road network. However, the original plans were not completed. In addition, the rapid development of housing took priority over preservation of old buildings. 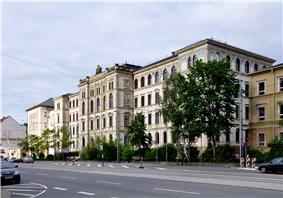 So in the 1960s and 1970s, both in the center as well as in peripheral areas, large areas were built in Plattenbau apartment-block style, for example Yorckstraße. 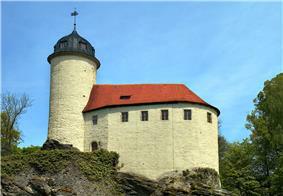 The old buildings of the period, which still existed in Kassberg, Sonnenberg and Schlosschemnitz especially, were neglected and fell increasingly derelict. On April 23, 1990, a referendum on the future name of the city was held: 76% of the voters voted for the old name "Chemnitz". On 1 June 1990, the city was officially renamed. 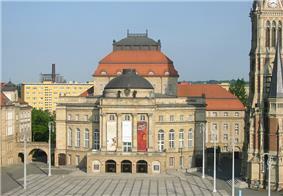 After the reunification of Germany on 3 October 1990, the city of Chemnitz faced several difficult tasks. 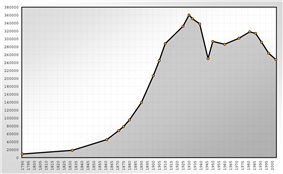 Many inhabitants migrated to the former West Germany and unemployment in the region increased sharply; in addition Chemnitz had no downtown, but it was increasingly demanded, while simultaneously large shopping centers were constructed on the city periphery to the early 1990s. 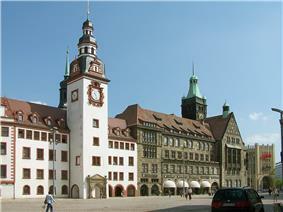 Chemnitz is the only major German city, whose center was re-planned after 1990, similar to the reconstruction of several other German cities in the immediate post-war years. Plans for the recovery of a compressed city center around the historic town hall in 1991 led to an urban design competition. This was announced internationally by the city and carried out with the help of the partner city of Düsseldorf. The mooted project on an essentially unused area of the former city would be comparable in circumference with the Potsdamer Platz in Berlin. Numerous internationally renowned architects such as Hans Kollhoff, Helmut Jahn and Christoph Ingenhoven provided designs for a new city center. 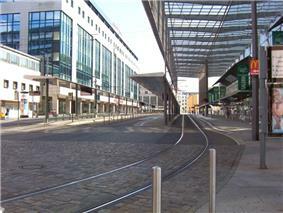 The mid-1990s began the development of the inner city brownfields around the town hall to a new town. 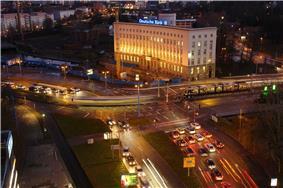 In Chemnitz city more than 66,000 square meters of retail space have emerged. With the construction of office and commercial building on the construction site "B3" at the Düsseldorf court, the last gap in 2010 was closed in city center image. The intensive development included demolition of partially historically valuable monuments from the period and was controversial. 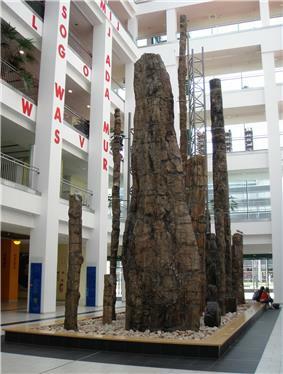 Between 1990 and 2007 more than 250 monuments were leveled. The city has changed considerably since German reunification. Most of its industry is now gone and the core of the city has been rebuilt with many shops as well as huge shopping centres. 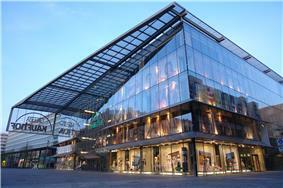 Many of these shops are international brands, including Zara, H & M, Esprit, Galeria Kaufhof, Leiser Shoes, and Peek & Cloppenburg. 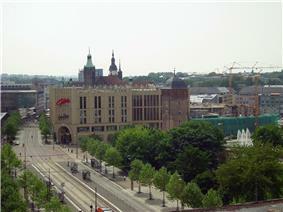 The large "Galerie Roter Turm" (Red Tower) shopping centre is very popular with young people. 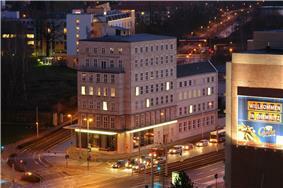 Chemnitz is crossed by the two motorways (Autobahn) A4 Erfurt – Dresden and A72 Hof – Leipzig. The motorway junction Kreuz Chemnitz is situated in the northwestern area of the city. The motorway A72 between Borna and Leipzig is still under construction. Within the administrative area of Chemnitz there are eight motorway exits (Ausfahrt). Chemnitz also has a small commercial airport (Verkehrslandeplatz Chemnitz Jahnsdorf) about 13.5 km (8.4 mi) south of the city. When its current upgrade is completed it will have an asphalt runway 1,400 m (4,600 ft) long and 20 m (66 ft) wide. ^ "Aktuelle Einwohnerzahlen nach Gemeinden 2014] (Einwohnerzahlen auf Grundlage des Zensus 2011)" (PDF). ^ Dankwart Guratzsch: Einer Stadt die Zähne herausgebrochen, Die Welt, 12. Mai 2006. ^ Gudrun Müller: Der Abrissrausch ist tödlich für Chemnitz, Freie Presse, 7. Dezember 2006. 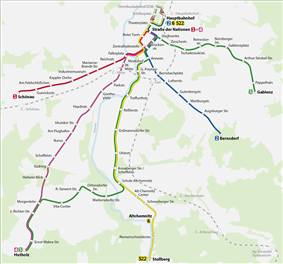 ^ "Chemnitz orders electro-diesel tram-trains – Railway Gazette". ^ "Medmestno in mednarodno sodelovanje". Mestna občina Ljubljana (Ljubljana City) (in Slovenian). Retrieved 2013-07-27. ^ "[via WaybackMachine.com]"Miasta partnerskie – Urząd Miasta Łodzi . City of Łódź (in Polish). Archived from the original on 24 June 2013. Retrieved 2013-07-21.